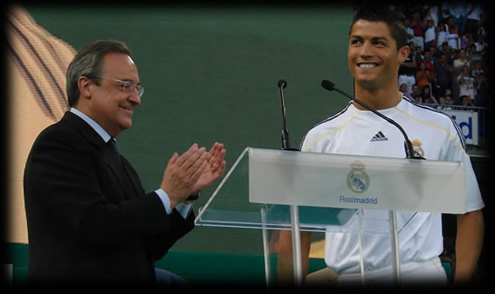 23.02.2011 » Florentino Pérez: "Cristiano Ronaldo lives for football"
Florentino Pérez has no doubts or hesitation when he needs to talk about CR7. The Real Madrid President says Cristiano Ronaldo lives exclusivelly for football. Cristiano Ronaldo doesn't leave anyone indifferent to his talent and unseen dedication to his profession. It was now time for Florentino Pérez, President of Real Madrid, to reveal his thoughts on CR7. Florentino Pérez: "Cristiano Ronaldo lives exclusively for football! He sacrifices his personal life for this sport. He dedicates completely to football, starting in the morning, afternoon and at night. And that happens because he wants to be the best. He wins money because anyone who is the number 1 in the world gets a lot of money." The Real Madrid President extended his comments on the spanish radio "Cadena Ser" and also spoke about José Mourinho. Florentino Pérez is confident that José Mourinho will remain as coach for many years to come in Real Madrid. "Mourinho has contract for 4 more years and I'm sure that he'll stay for a longer time. At this point, we don't even question if he's going to stay or not." Florentino Pérez is well known for his policy from the "Galáticos Era" also known as "Zidane and Pavons". He signed to Real Madrid several of the best players in the world in a short time of period and mixing them with some unknown players from the "Cantera". Signings like Luis Figo, Zinedine Zidane, Ronaldo and David Beckham were some of the big names who joined the club in that era. Cristiano Ronaldo and Kaká signings were already a year and a half ago. That kind of market approach made some journalists call it the "Galaticos Era II", but the policy seems to have slightly changed, since there was no "World Best Players" getting signed this year, but instead of that, some of the world most promising players joined the club, as Ozil and Di Maria keep prooving it this season. With Cristiano Ronaldo leading on the pitch and José Mourinho as manager, the future can only look bright for Real Madrid, even though they have to face one of the best playing teams ever as opponent, that being Barcelona. But even that fact, just adds more relavance and value to what Real Madrid is doing and will certainly do in the next years.